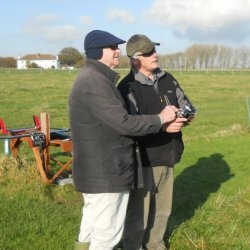 As an established model flying club, we are well aware of the problems newcomers face when embarking on what is a very challenging but enjoyable and rewarding hobby. We are, therefore, well placed to firstly advise the beginner regarding initial key decisions that have to be made e.g. - Model type i.e. Power/Glider. - Power source i.e. IC/Electric. Having made the initial choice of RC equipment, this also needs to include a decision regarding which mode to fly i.e. - Mode 1 - Throttle right stick. - Mode 2 - Throttle left stick. The Tadcaster club is broadly split 50/50 regarding Mode 1/2 flyers. We therefore have experienced instructors who are able to offer tuition in either mode. This tuition is then invariably effected by using the buddy system wherein the student is permanently connected to the instructors transmitter. This allows the instructor to regain control of the model at any time thus, greatly reducing the likelihood of mishaps occurring. Once the basics have been mastered, progression can then be made into passing our club test, which allows allows the member to fly at any time without supervision.